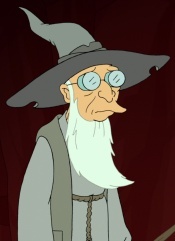 The Great Wizard Greyfarn is the Cornwood version of Professor Hubert J. Farnsworth, a powerful wizard and a member of the Fellowship. The Wizard parallels the life of the Professor in several key areas. He once had a relationship with Momon (the Cornwood version of Mom) and apparently sired Ignus (the Cornwood version of Igner). There are also points of difference between them, though. Greyfarn appears to live alone in an outhouse which is larger on the inside than the outside, became romantically involved with Gynecaladriel (the Cornwood version of Amy Wong), which Professor Farnsworth hasn't been seen to do. There is no indication that he is related to Frydo (the Cornwood version of Philip J. Fry). Greyfarn seems to be a skilled magician, and much more active than Farnsworth. When Frydo, Leegola and Titanius Anglesmith arrived at his house with the Die of Power, Greyfarn told them of Momon and her sons. He informed them that the only way to destroy the die was to throw it into the boiling plastic from hence it came, the Geysers of Gygax. After Frydo and Leegola ran away, the remainder of the Fellowship, including Greyfarn, continued to Wipe Castle to try to raise an army. Unfortunately, the king of Cornwood had gone insane and sent his army into the ocean, killing the soldiers and leaving the kingdom defenseless against Momon's army, which invaded shortly after the Fellowship arrived. Greyfarn and the rest of the fellowship was rescued when Leegola returned with an army of Centaurs and killed the remaining invaders. Later, at the Gysers of Gygax, Greyfarn was confronted by Ignus and a battle began, during which Ignus revealed that he is Greyfarn's son. Greyfarn is heavily based on the Lord of the Rings character Gandalf. Greyfarn is featured on the Bender's Game disc of The Complete Collection 1999-2009. Greyfarn: Curse you, Momon, queen of all that is evil and not very good in bed! And I not saying that because she dumped me. Greyfarn: Alas, our path is blocked by Momon's army of evil, as well as her navy of moral dubiousness. This page was last edited on 28 August 2013, at 22:42.